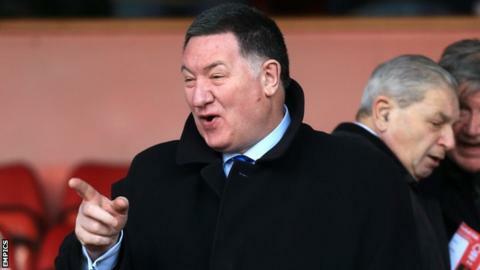 Peterborough United chief executive Bob Symns has said promotion back to the Championship is worth up to £8m a year to the club. Posh face Leyton Orient in a League One play-off semi-final first leg at London Road on Saturday after finishing sixth. "It's worth around £5m to £8m. It really does make that sort of difference," Symns said. "It's a phenomenal amount, a lot of it generated by the away support and the basic Football League award." The money received from the Football League rises dramatically between League One and the Championship from around £325,000 a season to £2.2m a season. Posh were relegated from the second tier on the final day last season and, should they make an immediate return, they will do so with a redeveloped Moy's End at their London Road ground. "There's a massive difference in the basic award from the Football League and then all the additional things through merchandise," Symns told BBC Radio Cambridgeshire. "Plus there's the extra away support, it will put on average an extra 3,000 supporters here on Saturdays and you can't buy that. "Our chairman wants to continuously reinvest into the playing side of things, while we're getting on with the development behind the scenes. "We want a bigger, better football club."